Anyone who lives in the city but loves the countryside has, at some point, found themselves longing for a short trip to the country. What if the farm could be brought home and into perhaps the attic? Sounds a little far-fetched at first but the truth is that it can. Just like locomotives enthusiasts, farm enthusiasts can build their own little area with all the things that one would find on a farm. If you are new to this, then the surprise will come when you take a look at a variety of models that are available to make your miniature farm as accurate as possible. The thing that has surprised us the most was the detail. There is such a vast quantity of different models of various farm machinery including grain augers, grain stores, vegetable harvester tractors as well as an enormous list of other implements. While these are just models, one has to appreciate the detailing that really makes these models come to life. While the models may be miniature, the setting boards certainly aren’t. 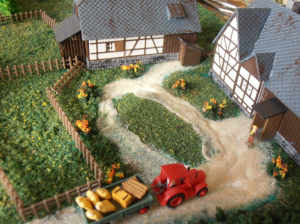 Many of the landscapes for these models are set on a board that can be six feet by six feet; it really makes it easy to appreciate the hard work and the keen eye that these enthusiasts must exercise to make their farms look as life like as possible. 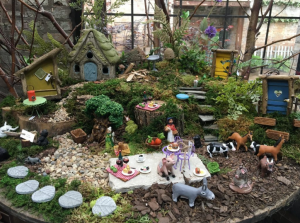 Once in a while you might catch a small exhibition which enthusiasts set up at a country fair and most people will appreciate the dedication and the time taken to build these displays. Should anyone be interested in starting their own little farm, enthusiasts are, more often than not, only too happy to share tips of where to buy the materials necessary and how to get started. They can offer planning and building advice that has been learned over the years and the mistakes that might be encountered with such high detailing. This hobbyis a test of patience and also a labour of love. It has to have a dedicated space and you will find yourself buying more and more things to develop the farm just like a real farmer. The shops that sell the models are not very common as this is not a hobby that has a high demand but it is certainly a well-loved one by those who are enthusiasts. If you are interested in trying this hobby, first order of business is to find the closest shop to get inspiration and head there to have a chat with those with the most experience. One thing that is essential is to have a plan in mind of what you want to build since there are many kinds of farms to use as a basis for your miniature. Plenty of model animals can be purchased to build a cattle ranch or a dairy farm as well a grain farm. The possibilities are limited only by the enthusiast’s imagination!